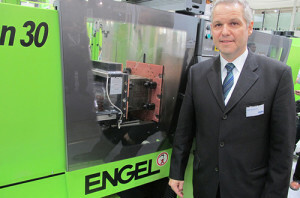 Engel Austria is another injection molding machinery maker to host an additional booth in Industrial Automation Zone. The highlight was the Engel e-pic small-size robot, making its debut in Asia at CHINAPLAS 2015 after its premiere at the Fakuma last year. “The time frame that advanced machinery in Europe being brought to China is getting much shorter nowadays,” observed Gero Willmeroth, Sales and Service President at Engel Machinery (Shanghai). The new e-pic is economical solution for easy part removal, sprue separation and controlled depositing, grid depositing and stacking of small components. A new kinematics helps to achieve high efficiency by combining linear movements with a swivel arm. Another important efficiency factor is the use of weight-optimized parts which keeps the accelerated masses low. In this way, the servomotor-driven robot can shorten possible take-out cycles with low energy consumption. In comparison with linear robots of the same size, the Engel e-pic reportedly only needs half the amount of energy. For Engel, around half of its large-size injection molding machines sold in China is equipped with their own robots. It is the smaller machine that offers bigger possibilities. On average, 30% of Engel machines in China come with automation technology. Mr Willmeroth hopes to increase the share to 50-70%.